What is a Good Bounce Rate? All content on this site has been written by Martin MacDonald, but its currently undergoing some transformation in the background. More on that to come, but in the meantime, follow @searchmartin on twitter. Is Direct Traffic a Ranking Factor? If you had access to “Google Level Data”…? Google announced late yesterday that starting September, advertisers on adwords will no longer be able to use Exact Match keywords to drive their ad spend. For non Adwords advertisers, exact match has always been the mainstay of a well optimised large account. They were the only keyword type that allowed you to specify exactly what keyword you wanted an ad to appear for, with a specific bid to that keyword – therefore you could bid separately plurals, mis-spellings and so on. Come September, these could all be triggered as close matches from just one keyword in your Adwords account, this will result in more traffic which is likely to be relevant to your small business. If you have spent time and effort already, optimising your Adwords account to include all possible variants that you were interested in, and have set specific bid prices for each one, then that work will soon become irrelevant and the keyword/ad combination with the highest quality score/ad rank for the search query will now be triggered, regardless of whether you’ve elected to have a specific combination show for a keyword phrase. This will negatively impact advertisers who might have different bidding strategies and ad copy for plural search terms which may have yielded a lower conversion rate but higher basket size. There are plenty of potential terms which will fall foul of the increased loosening in targeting, plural only nouns with a unique meaning in the singular form (bear with me here) specifically need to be considered, as these will throw phrase matching keywords into impressions that aren’t relevant and will therefore reduce CTR and negatively impact your quality score (hence, increasing bid price). To illustrate, someone searching for “Business Premise” or “Business Premises” are looking for entirely different things, but if you happen to have either of these in your adwords account, your ad will soon be triggered regardless of user intent. Consider an advertiser trying to sell “Stained Glass”, who now has to compete in Adwords against another advertiser bidding on “Glasses Stain” to sell cleaning products! The quick answer for now would be to consider every term you’re bidding on, what the alternatives would be and then add those as a negative keyword. According to Google, for now at least negative exact match keywords remain exactly that – exact match. Where have you got this information. If it was announced surely there would be a link to the source. I can find any other information on this. Can you provide the source of your information? haha I like your comment JIm, Google just wants us to spend the entire Budget… Having spent 8 years at Google, this news does not surprise me! We all went bonkers when Enhanced campaigns launched… I still remember the number of meetings,discussions, and training we had to undergo to justify the change. So I would imagine the kind of research that would have gone into making this huge change. To say that exact match keywords would be removed is quite a stretch, though yes how they operate MAY change in terms of variants for a given account, as this announcement is not the same as having the ability to have exact match keywords removed altogether. 2. Minor technical note, but wasn’t sure when this article was posted. Only realised by the comments that it was probably recent and hence relevant / valid. 1) I craft my headlines for CTR from social & serps, can’t apologise for that 😉 HOWEVER I absolutely maintain that turning exact match into variant matching is absolutely killing off exact match. There’s plenty of examples in the post of words that can be easily misconstrued resulting in sub-optimal ad group performance. 2) Yeah, its taken a long time for anyone to notice that, I removed them a while back as an experiment to see if there was a difference in ranking of older posts once Id removed the timestamp. Appreciate it might be a bit of a pain to users, but it was a SERP test. Hey Deepti! I’m really, really interested in the wording in your comment: “training we had to undergo to justify the change”. That might imply that there was a clear recognition that advertisers would be unhappy with the changes as they were perceived not to be in their best interests, and you were taught how to get around it. Would you say that’s accurate? Just think how the spend will increase…. Win/win for Google, yet again! Not so much for businesses. I can’t help but feel you’re being a little over dramatic in how you frame the story. Exact match has always had close variant as the default setting, it’s the ability to turn this of that is being removed. 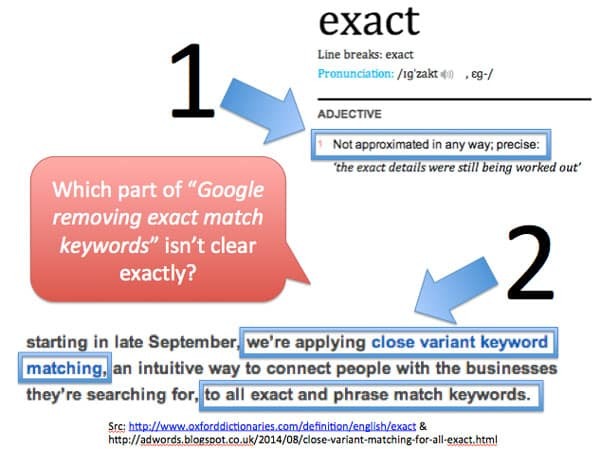 So yes, exact match is now variant match, but with exact match negative keywords still in play you can still achieve exact match via a different route. @phil Exact Match hasn’t “always” had close variant as a default setting, that was introduced a couple of years ago. When it was ANY advertiser worth their pay-check turned it off instantly. The reason we all turned it off, is it creates inefficiency into large accounts. Now we no longer have the option to make exact match be pure exact. That in my view, and likely the view of any other large adwords spender is tantamount to killing the match type. I get how this change may help, but I do agree with Mr. Steward that this is going to end up in wasted ad spend, high bounce rates, and running through your budget quicker than usual. The one thing that bothers me about having keyword variance in relation to my accounts, is the fact that I do receive different traffic for singular and pluralized terms, and the only known ‘solution’ for this, in order to preserve my budget, is to add a large number of terms to the negatives. Maybe I’m missing something, but how is having ‘Arm’ as variable match with ‘Arms’ as exact match negative not the same as having ‘Arm’ as an exact match keyword? Sure it’s annoying having to set all the negatives for possible misspellings, plurals etc. it get’s you to the same end though does it not? Arm as a singular word is a part of the body, if a noun, or to give someone a weapon, if used as a verb. Arms as a plural could mean a part of the body or it could refer to weapons – it introduces an ambiguity into the noun. I think this is the point Martin was making. Hi, after seeing this we all went into slight panic mode here. We have literally millions of keywords. After a quick chat with our Google account manager it is nothing to get too stressed over, and is quite misleading. To check to see if you are already opted in (which I think it does by default) In the campaign settings tab, towards the bottom there is the Advanced Settings feature. Under Keyword Matching Options there are 2 settings. If your campaigns just target Search Network only, then chances are you already show for the close variants of keywords. If you don’t then this change will affect you, by there not being a choice any more. Either way it will have very little effect. Just make sure you use negative keywords! You shouldnt be using the Google search network by default, you should split those campaigns out into a seperate view so you can track the effectiveness and ROI of search partners. For instance, did you know that the adsense like blocks at the bottom of eBay listings are considered part of the search network? Removing that alone cuts down a decent % of impressions that you don’t get clicks on, and when you do the conversion rate is extremely low. Bottom line, control is good. Allowing Google to control your ad spend often is not. I think Google cares very much about campaign performance. Most people use Google because they think it provides the best results. Google has a lot invested to keep people thinking this way. Google has little choice but to provide the highest quality user experience that they can provide. Here there is the option to “Include plurals, misspellings and other close variants” or “Do not include close variants”. I believe that if you are targeting just the search network then the close variants option is by default selected. Thus, the majority of campaigns will not be affected. Of course control is good. The more control the better, however the subject of the article is very misleading and it is not simply the case that they are removing exact match keywords. They are removing the option to include or exclude close variants, moving everyone to include this option, but as mentioned previously, most campaigns whether advertisers are aware or not, will automatically be included already. So the change is minimal. I’ve been using adwords every day for 4 years and still is works well for my business. Google does care about your business and helped me save plenty of $$$ with phone calls to show me ho9w it thinks. (that can take ahile to learn let me tell you). I now can compete with big travel agencies with a low budget. Very successful I might add and exact keywords I use for certain reasons that I have tested for years and as of today 10/04/14 still works well. About Web Marketing School | About Martin MacDonald (c) 2007-2018 MOG Media Inc. All Rights Reserved.